Maratha warrior king Shivaji Bhonsle, better know as Chhatrapati Shivaji Maharaj passed away on April 3, 1680. Shivaji is one of the rulers who fought several foreign conquerors to bring back Maratha power. The warrior king established Maratha rule in Maharashtra by defeating the Mughal emperors. He was formally crowned as the Chhatrapati of Raigad in 1674. And on the Shivaji Maharaj Punyatithi, Twitter is buzzing with tributes to the ruler. His secular thoughts reflected in his royal army which included Muslim soldiers. He often sought advice from religious leaders of all castes. The king and his brave works will be forever remembered in the minds of Indians. After snatching the power back from Mughals, he established the navy and strategically built forts to defend the coastlines of Maharashtra. The forts in Jaigad, Vijaydurg, Sindhudurg, and other places stands proof of how fortification was of much importance to the King. Chhatrapati Shivaji Maharaj 339th Death Anniversary: Powerful Quotes to Remember the Great Maratha Leader on His Punyatithi. Shivaji is also known for not tolerating any violence against women. Severe punishments were given to those violating the rules in his kingdom. In fact, women of captured territories were released unharmed and treated with honour and integrity. And on the 339th death anniversary of the valiant king, Twitter is pouring in with tweets saluting the great works of the emperor. Chhatrapati Shivaji Maharaj 339th Punyatithi: Facts About The Great Maratha Warrior King on His Death Anniversary. Chhtrapati #ShivajiMaharaj was a dependable supporter of women & their honour. He opposed all kinds of violence, harassment & dishonour against women. In fact, women of captured territories were also released unharmed & with integrity. It is believed that Shivaji was named after Lord Shiva, but he was actually named after a regional Goddess Shivai. Shivaji was greatly influenced by his mother, Jijabai since childhood who told about the existing Mughal rule which needs to be overthrown. Dadoji Konddeo who was an administrator of the Poona jagir trained Shivaji in weapons as a child. One of the famous stories of Shivaji's bravery and intelligence is how he escaped from Aurangzeb's captivity in a box of sweets. Another story of his bravery is how he killed Adil Shah who was quite bigger to him in stature by arranging a meeting with him. Tribute to Chhatrapati Shivaji Maharaj on his death anniversary. 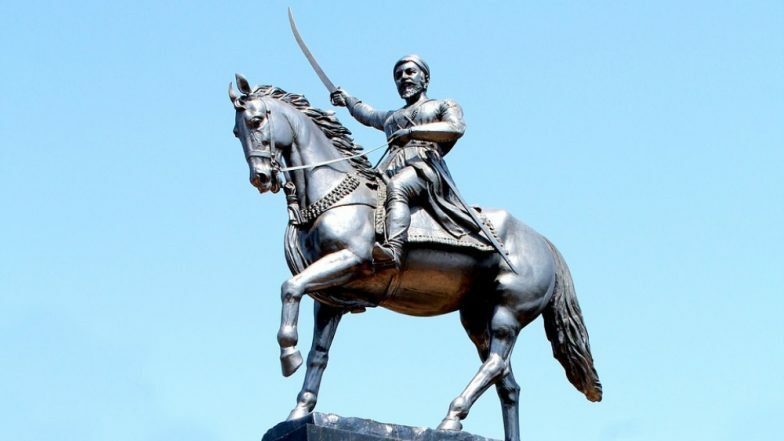 He is considered as the greatest King Maharahstra has ever seen. Shivaji was also known for employing Guerrilla tactics in which surprise attacks, raids and ambushes with small groups were carried on his enemies. for which he was called the 'Mountain Rat'. The king continues to be a source of inspiration and pride for people of the country. Shivaji died due to fever and dysentery in 1680 at the age of 52 while his legacy continues to go on. Amitabh Bachchan Surprises Fans by Tweeting in Tamil, Shares Two Pictures From the Sets of Uyarntha Manithan!